The figure – published in the ebook 8,000 Holes – casts doubt on the promise by organisers LOCOG that 90% of places would be made available to the general public. Three smaller campaigns conducted by LOCOG through 72 local authorities and islands hosting the relay, schools in the Get Set Network, and 20 countries in the International Inspiration programme, take the figure up to 75%. Early in the organisation of the torch relay, it was said that 90% of places would be made “available to the general public“, or as Reuters reported “people nominated through public campaigns run by LOCOG and sponsor partners”. In total just under 2,000 places were allocated through internal channels outside the public campaigns, including the three main sponsors, commercial partners, national sport bodies, the British Olympic Association, LOCOG and the IOC. However, they cannot provide details of which members of the general public had been nominated, or whether any processes existed to ensure that the 90% claim could be met. The full data for torchbearer allocations is available here. 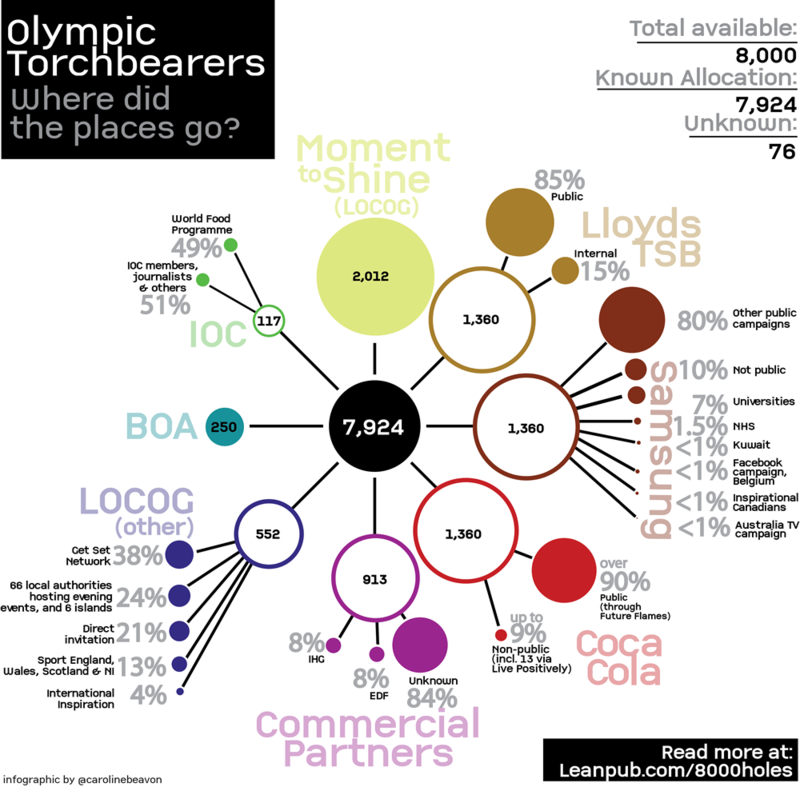 This entry was posted in Data and tagged adidas, BOA, Caroline Beavon, Coca Cola, Get Set Network, infographic, International Inspiration, lloyds tsb, locog, Samsung, torchbearers by Paul Bradshaw. Bookmark the permalink.